As a part of the December 2012 update to CRM 2011, which also brought us the new and improved Polaris UI experience, Microsoft has gone all-in on the social integration with Dynamics CRM. 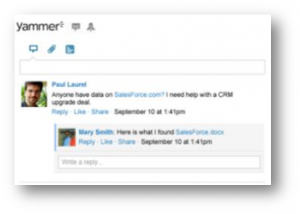 Before we were given the ability to highlight new deals and signed business using the Post entity and the Activity Feeds views built right into CRM, but with Yammer integration we can now expand CRM news and details to the entire organization. With the added integration, users also gain input and commentary from the non-sales personnel inside of their company right as a part of their CRM experience. Even prior to their acquisition by Microsoft, a lot of large companies have adopted the Yammer platform for their internal employees to have a safe, viable social media network for sharing information and ideas that would otherwise be relegated to mass emails, or just not discussed at all. Geared toward non-public information and discussions, Yammer is a Twitter-like social media network with a lot of the collaboration and search features of Facebook and the easy to use, short text-update interface of Twitter and Sina Weibo. In a “former life” one of my employers had flirted with Yammer for close to a year, evolving from the free application to the paid subscription for internal collaboration and sharing. To me it was a success at sharing information and giving a good look into the operations and daily activities of a nationally dispersed workforce, but I think further personality and culture issues sabotaged the system from the outset. In the end, it was deemed too expensive for them to continue based on participation rates, but a strong and healthy company with a dynamic culture could benefit greatly from an app like Yammer. It bridges the gaps between multiple locations and multiple teams, giving that face-to-face interaction that just can’t be duplicated with a once a year Christmas party. Inside of CRM, the social media integration has been a large success in my implementations of CRM 2011 for several clients and my own company. Being able to get a live, streaming update of movement and progress in various sales activities and processes helps keep us all on top of status across the board. Views, searches, and reports offer one look at the sales organization as a whole, but nothing beats the ability to go into the system and see a listing of all of a single user or team’s activities and closed or new business opportunities in one timeline stream. Call me a Facebook-addict, but it’s how we’re getting used to seeing information. So if your organization uses CRM 2011 and not Yammer, I highly recommend piloting the software with a group of your employees just to try out the collaboration and information sharing tools. If you do use Yammer, and you want to see your social media experience taken to the next level, then make sure you’re running the latest Roll-up in CRM and enable the Yammer integration today!